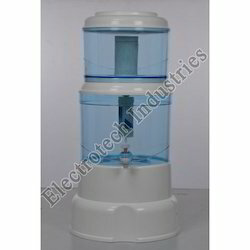 Our organization has specialization in providing a superior range of Mineral Water Pots. We offer Mineral Water Pots in various sizes and segments. Thease are available in 15/16 Liters, 18 Liters 22 liters capacity.Our products purify the contaminated as well as chlorinated water to natural mineral water. These pots remove the unnecessary and harmful substances with unpleasant odor and colors. Our range is provided with and without UF cartridge (Both Segments) and high quality carbon cartridge, ceramic Filters and five stage Cartridges that provide pure and crystal clear water. In order to fulfill the ever changing demands of our clients, we have been engaged in offering a quality range of Mineral Water Pot 15 Ltr (U.F). The offered range of these mineral water pots is admired in the industry, owing to its long life, easy maintenance, high quality and durability. Also, this range is available in different capacities as per the demands of clients and does not require electricity for working. Mineral Water Pot 16 Ltr is a traditional method of purifying chlorinated or contaminated water to a Natural Mineral Water. It follows 7 Steps to filter normal water to mineral water. Purification stage- 7 Step Filtration: 1st step: ceramic dome filter, 2nd step: granular activated carbon, 3rd step: silica sand, 4th step: zeolite, 5th & 6th step: mineral stones & mineral sand dish, 7th step: magnetic water tap. Specification: 18 liters capacity, 100% Pure Mineral Water, 7 Stage Purification, Filter Capacity : 35-65 liters/ Day, Net Weight : 3.75 Kg. Features & Benefits of 18 liters Mineral Filter: Micro hole ceramic filter, Releases inorganic mineral elements needed for human body, Streamlined & contemporary design, Granular activated carbon cartridge, No electricity required, Removes chlorine, chemicals, bacteria, iron & dust, Eliminates odour & improves taste, No plumbing required, Hassle free maintenance , Fill water and drink directly. We are engaged in the manufacturing and exporting of Mineral Water Pot wide 22 liters capacity that purifies the contaminated and chlorinated water to the natural mineral water. All the Mineral Water Pot unnecessary and harmful substances with unpleasant odor and colors are removed with UF cartridge and high quality carbon cartridge, resulting in a pure and crystal clear water. The Mineral water Pot removes all the dissolved and solid impurities with hampering. 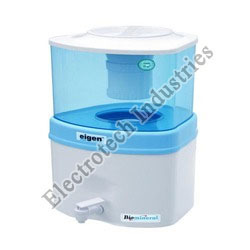 The Mineral water Pots are available in varied capacities and models. Turn Regular water into mineral water.